It happens to us all. The recipe bombs. Served with a side of humor are ideas for how to salvage a bombed recipe even as company arrives. It happens to everyone. In spite of your best effort, a recipe just bombs. It looks horrible. Sometimes it even tastes awful. And it’s frustrating and embarrassing. 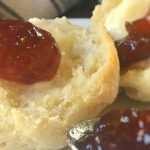 Today I’m sharing with you one of my recipe failures. If a dish looks awful but still tastes good, it may be possible to reimagine it. Here are some ideas for what to do to salvage a bombed recipe. My husband and I still laugh about the Black Bean Soup of 1990. We’d recently been to a restaurant where we enjoyed wonderful black bean soup. 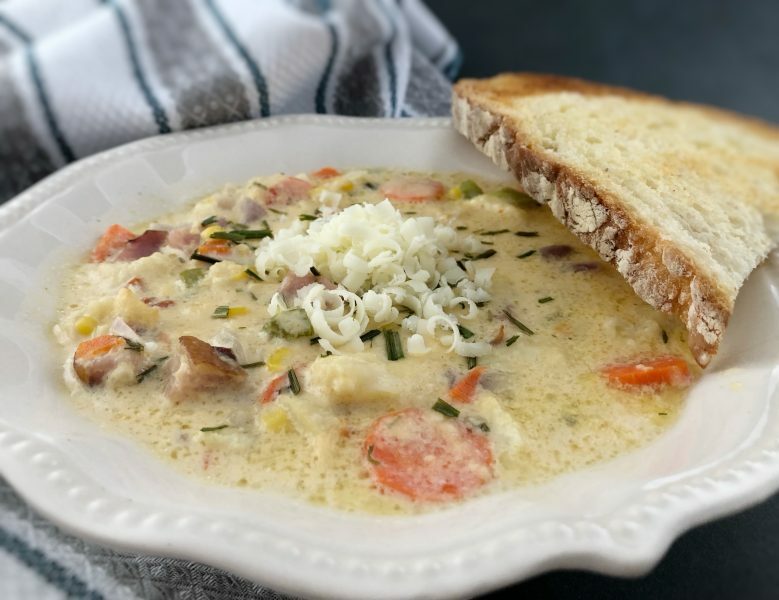 As a young bride, I wanted to surprise him after work one day with a delicious homemade version of this soup. With no Pinterest or even the internet, I was on my own. I bought a package of dried black bean, an onion, carrots, celery, bay leaves, and bacon and went to work. The onion, carrots, and celery got chopped and put in the pot with the dried beans, long strips of bacon, and seasoning. I don’t know why I put whole strips of bacon in the soup. It’s a mystery of the universe. And I didn’t soak the beans. I thought they’d soften as they cooked for about 10 minutes. Like pasta, right? You don’t soak pasta. 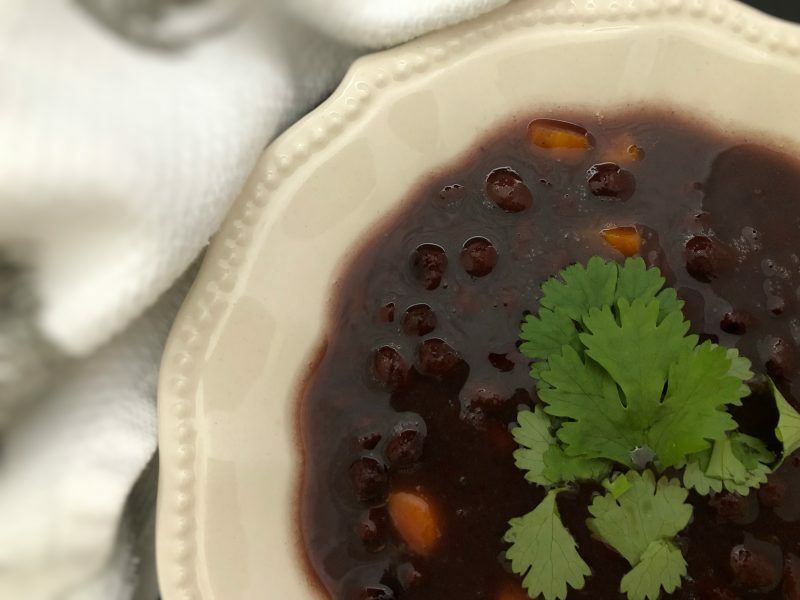 I want a photo of black bean soup in this article, but I can’t find one for free on the internet. This is a can of black beans I put in a bowl, added some chopped carrots, garnished it with cilantro and photographed it to add to the story. You see, I will NEVER make black bean soup again. I want you to know this is not a photo of a recipe I made. It’s just a prop for this article. After simmering about 30 minutes, our little apartment is smelling great. My husband comes home and comments on how great dinner smells. He goes to the pot of soup on the stove, lifts the lid, and just stares at it blinking. I ask him what’s wrong. I cheerfully tell him its black bean soup. He’s going to be so thrilled! “It is?” he asks warily. He gets a spoon out of the drawer, dips it into the soup and pulls out this long, dripping strip of bacon. The bacon strip is black as ink. The liquid dripping from it is black as ink. My lovely smelling soup looks like a squid had a fright right in the pot. My heart sinks. I thought I did so well. He hugs me and tells me he appreciates the effort and is proud of me for trying. Then we look up the number for pizza delivery. Is this a nightmare scenario or what? There’s even a television commercial where a young woman has a date coming over for dinner and she burns the duck shortly before his arrival. She calls her father and he gives her good advice: make pasta. I keep some shrimp and scallops on hand in the freezer. In the pantry, I keep pasta, a jar of marinated artichoke salad, a few varieties of pesto, fresh garlic, a jar of marinated sun-dried tomatoes, and parmesan cheese. Start cooking the pasta and thaw the shrimp and scallops in a colander under warm running water. Then heat a skillet drizzled with olive oil and a pat of butter on medium heat. Pat the shrimp and scallops dry with a paper towel and along with some finely chopped fresh garlic sear them until they’re cooked through in the skillet. When the pasta is done, drain it and toss the shrimp and scallops into it. Then add as much of the artichoke salad pieces and sun-dried tomatoes as you like. Add a couple of tablespoons of the oil marinade as well for flavor. Add your favorite pesto and mix it all well. 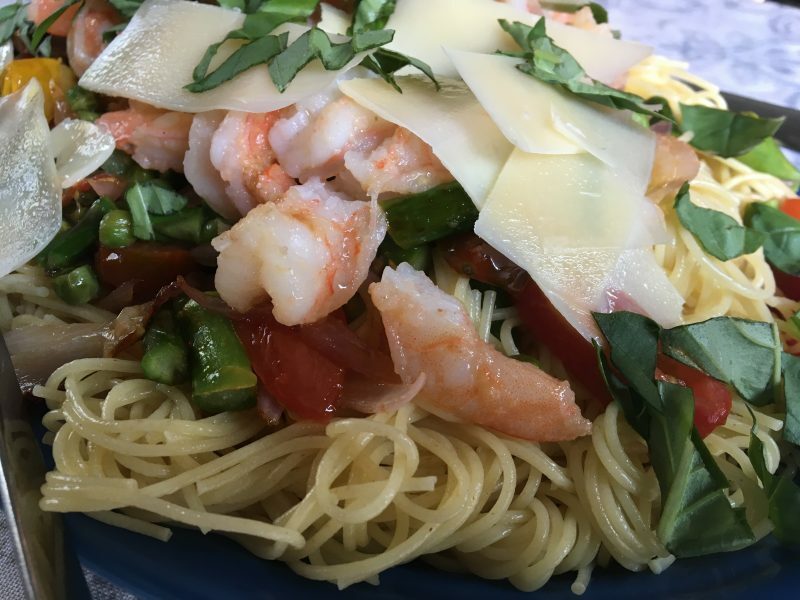 Pour it onto a large serving platter and garnish with shredded parmesan and fresh or dried basil. It’ll save the day, I promise! 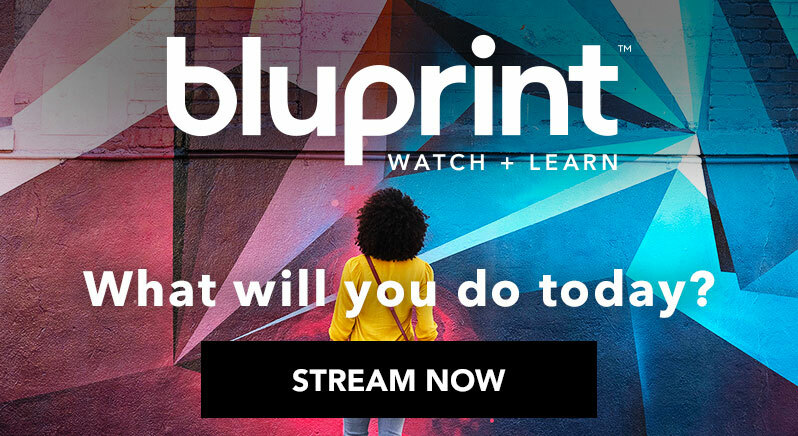 Your visitors will love it! Here’s pasta dish I threw together this summer when a brisket I smoked turned out to be almost all fat and little meat. I’m committed to getting more vegetables into my daily diet. And the other day I was really hungry for scalloped potatoes and ham. But I don’t want the heaviness of all the potatoes. I decide to substitute cauliflower, carrots, and a little sweet corn for the potatoes. So I make Scalloped Veggies & Ham. The sauce is thin. It’s unappealing to the eye. But it tastes really good! I’m not going to feed this to the chickens. It might make a nice soup. 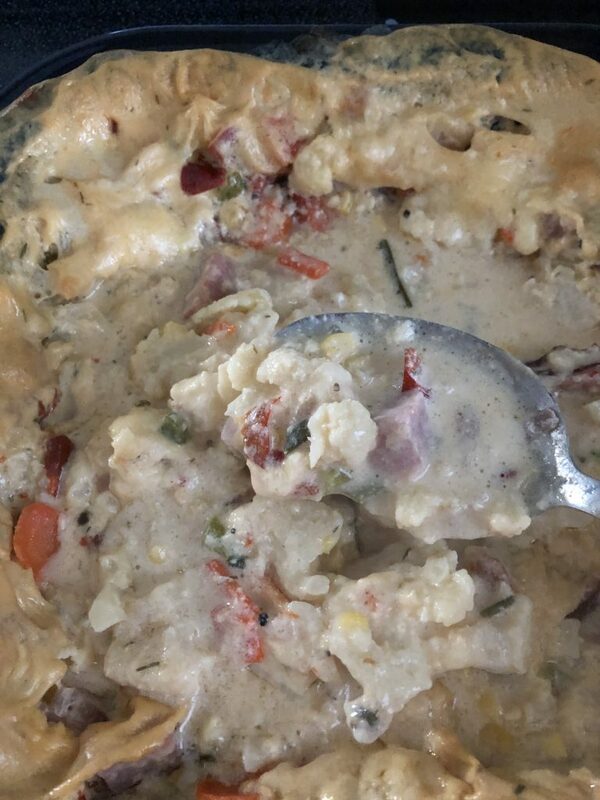 I remove the “skin” from the Scalloped Veggies & Ham and put the filling into a saucepan. A little extra milk and seasoning yielded a thick, hearty, Creamy Vegetable & Ham Soup. I keep a loaf of artisan bread in the freezer. 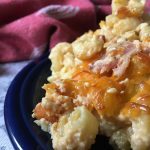 It pairs beautifully with the re-imagined Scalloped Veggies & Ham! Most casserole-style dishes can easily be revamped into a delicious soup. 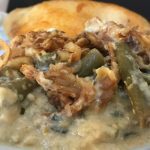 Is your Chicken Pot Pie runny? Carefully remove the crust, cut pretty shapes out of the crust with a cookie cutter, add a little milk to the filling and warm it through. Ladle it into a pretty bowl and top it with the pretty shapes. Now you have a creamy chicken soup! Sometimes the cake falls in the oven or breaks apart when we try to take it from the pan. Don’t panic. Cut it up into cubes and get out some pretty wine goblets or wide-mouth Mason jars. 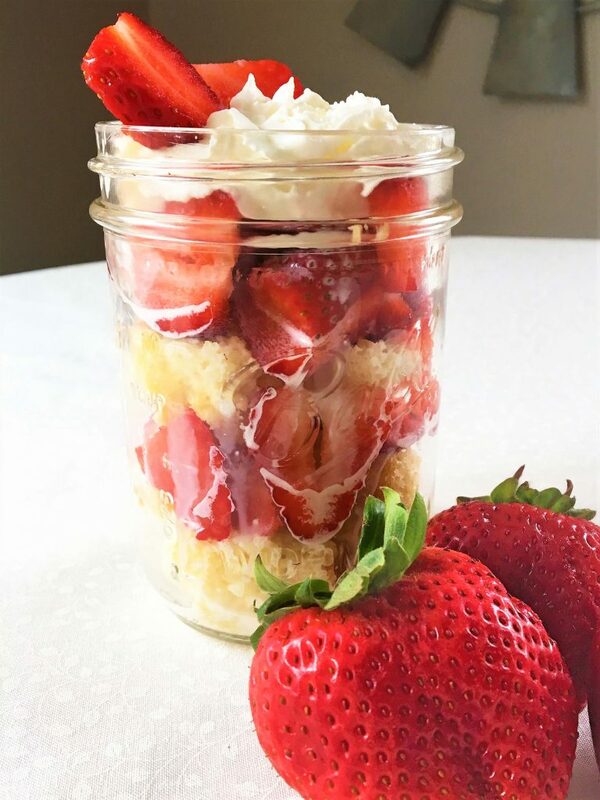 Layer cake cubes in the glass with fresh or frozen berries, Cool Whip, instant pudding, ice cream, or a can of pie filling. Here is my Farmhouse Strawberry Shortcake. What a fun way to serve a classic summer dessert! It’s also an inspiration for any flavor cake that might fall or break apart while being taken from the pan. For example, chocolate cake that breaks or falls will still be delicious served this way. A bombed recipe is frustrating but doesn’t always have to be a disaster. If it still tastes good, try using some of these tips to re-imagine the dish. And if that fails, more and more grocery stores have hot, prepared meals that can be picked up at the counter. If this is what needs to be done, save a few minutes by calling ahead so they can have it ready for you. Have you had a recipe bomb? What did you do? Did you re-imagine it or call out for pizza? I’d love to hear about it! Okay… I smiled through the whole thing! I could just see it go down! Helpful tips, too! Pinned! Well, ya gotta laugh when these things happen. 😂 I’m glad the tips are helpful. Thanks for sharing at Homestyle Gathering! I hope others get to enjoy your humor and tips! Great ideas! Thanks for sharing. I found this through the Homestyle Gathering. Thank you, and I’m so glad you visited Homestyle Gathering. Wonderful ideas from very talented ladies. Kay that bean soup story will haunt me forever. 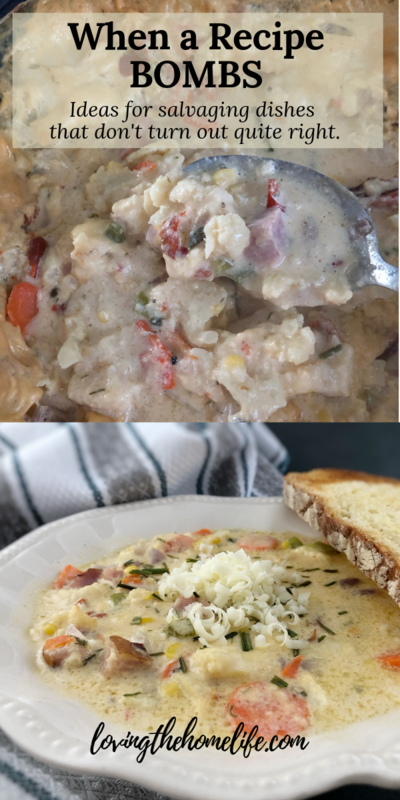 I really enjoyed reading this post and I will definitely try the tip about turning casseroles into soups especially when they are packed with healthy alternatives. Amazing tips! They seem delecious! You just got me hungry. Thanks for the detailed description and explanation. You have lots of information about food to share. Thank you Ade and Chris! I do my best and I’m glad to be of help. You know this is a really good outlook on failed recipes. Like hey! Yeah didn’t come out how you wanted but it’s still delicious food that you could repurpose. Awesome! I’m glad you like it! Unless it’s inedible, I think there’s usually some way to repurpose it. This is a fantastic article. I LOVED it. My first”mistake” dish I was trying to impress my husband with was beef wellington. It was such a disaster. LOL 20+ years later, I still haven’t made it again and whenever we see someone making it on TV we just laugh and laugh. I’m so happy you loved the article and that it brought back a fun memory!! 😀 I think there are a lot of young brides with stories like ours. You just have to laugh!